No Air Conditioning required for this PLC! Director 1050 Jr. is a High Value PLC at very attractive cost. It has all the Programming Instructions of the Standard Director Series Tough PLC as well as has the capability to plug-in any one of the 26 Uticor I/O modules. 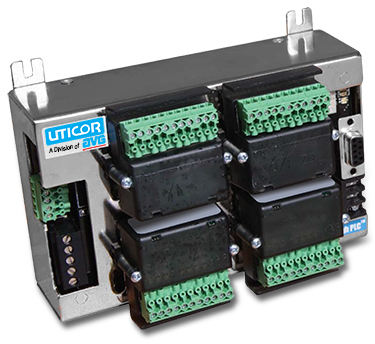 It does not have RS485, Profibus / DeviceNet or Ethernet capability, thus limiting it to a maximum 32 I/O. It also does not have Real Time Clock. Director 1050 Nano is also a High Value PLC at very attractive cost. It has all the Programming Instructions of the Standard Director Series Tough PLC, however it is a fixed I/O PLC. It has 16 digital inputs (10-28V DC sourcing) and 8 Relay outputs capable of switching 10Amps at 250VAC. It does not have RS485, Profibus/DeviceNet or Ethernet capability. It also does not have Real Time Clock.